Exxon Mobil Corporation is commencing development of the Julia oil field in the Gulf of Mexico, the oil giant announced yesterday in a press release. Capital cost for the project, which is expected to begin oil production in 2016, is estimated to be more than $4 billion. 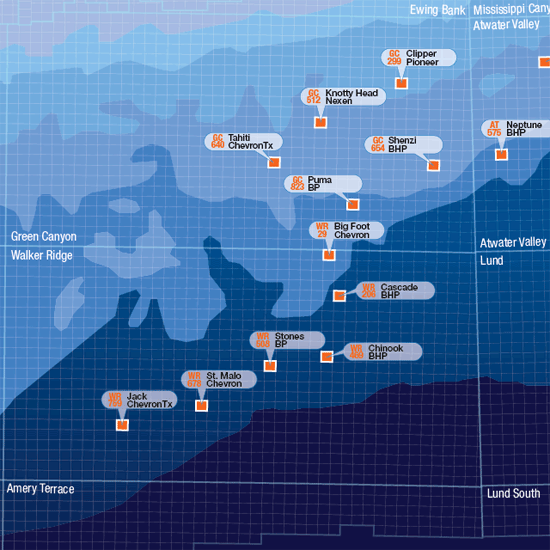 The field was discovered in 2007 and is estimated to have nearly six billion barrels of resource in place. The initial development phase is being designed for daily production of 34,000 barrels of oil and includes six wells with subsea tie-backs to the Jack & St. Malo production facility operated by Chevron U.S.A. Inc. Julia project front end engineering design has been completed and the engineering, procurement and construction contracts have been placed. The Julia field comprises five leases in the ultra-deepwater Walker Ridge area of the Gulf of Mexico, 265 miles southwest of New Orleans. The blocks are WR-584, WR-627, WR-628, WR-540 and WR-583. ExxonMobil, the operator, and Statoil Gulf of Mexico LLC each hold a 50 percent interest in the Julia unit. Over the past decade, ExxonMobil has drilled 36 deepwater wells in the Gulf of Mexico in water ranging from 4,000 feet to 8,700 feet. InterMoor successfully replaced (8) spiral-strand platform wires on a permanent production facility in May 2011 without requiring a platform shutdown or loss of production. The operation was completed using a single Construction Anchor-Handling Vessel (CAHV) at a significant cost savings from the traditional method involving a derrick barge. Each mooring line consisted of unjacketed spiral-strand wire at the fairlead, two sections of jacketed spiral strand in the water column and studless chain at the seafloor. Syntactic-foam submersible buoys had been installed at each spiral-strand wire connection, so each mooring line had two buoys. Only the platform wires were to be replaced, and the remaining mooring components including the buoys were to be reused. Protecting the existing components from damage during recovery and reinstallation posed several unique challenges. One of the main operational challenges was to design a way to bring the upper buoy and platform wire out of the water and secure them on deck so that the old platform wire could be disconnected. To accomplish this, InterMoor designed and installed a custom hang-off porch at the CAHV’s stern. The porch used a combination of pneumatic and hydraulic cylinders to manipulate and align the entire porch as each buoy connection was recovered and deployed. The porch also had separate stoppers for the socket connections and a removable cradle for the buoy. Another operational challenge was the unknown condition of the buoys themselves, particularly since they were to be reused on the replacement wires. There was no industry experience at the time in retrieving foam buoys that had remained submerged at depth for over a decade. This paper will explore these challenges and others in more detail as well as the steps that were taken to successfully overcome them. Subsea World News – USA: MOSS Reviews Permanent Platform Wire Replacement. New York, 13 March (Argus) — Chevron said its efforts to boost recoveries in the Lower Tertiary trend of the US Gulf of Mexico may double the amount of crude and natural gas extracted from its $7.5bn Jack/St Malo development. The October 2010 decision to go forward with Jack/St Malo was predicated on recovering less than 10pc of the crude and gas in place, or about 500mn barrels of oil equivalent (boe) over the life of the deepwater development. Technological advances may drive recoveries to more than 20pc, or 1bn boe, Chevron North American upstream president Gary Luquette said today. “We have effectively added a half billion barrels to Jack/St Malo, and we’re looking to apply what we’ve learned here to other Lower Tertiary developments,” Luquette said. Deepwater projects will be key in Chevron’s plan to boost upstream production by 20pc, to 3.3mn boe/d, by 2017. The company aims to increase its global deepwater output to 470,000 boe/d from 375,000 boe/d. The Jack/St Malo platform, which will have a tieback to at least one other field, will have capacity to handle 170,000 b/d of oil and 42.5mn cubic feet/day of gas. Lessons learned from early struggles with the Shell-operated Perdido development, which began production in March 2010, will help with other Lower Tertiary projects in the Gulf, Luquette said. Perdido was slower to ramp up than planned, but now is at more than 90,000 boe/d. Chevron intervened to make design changes to the Hess-operated Tubular Bells project, also in the Lower Tertiary trend, increasing the major’s confidence that the development will be done on budget and on plan, Luquette said. Jack/St Malo and Tubular Bells are both scheduled to commence production in 2014, as is the Chevron-operated Big Foot project in the Lower Tertiary. Lower Tertiary oil deposits are beneath a thick salt canopy, making exploration more difficult, and are characterized by high pressure, high temperature and low porosity.